This year, at 21 months, Daniel got the full flavor of Halloween. First, his teachers at daycare started introducing Halloween a few weeks ago already. There was all kinds of activities around pumpkins and reading Halloween books. He has become an expert at saying "pumpkin" and "Halloween" by now! 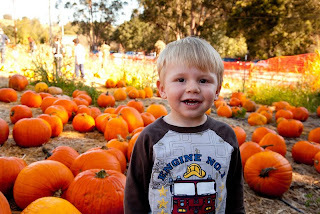 We also visited a pumpkin patch last week, and Daniel had a lot of fun carrying pumpkins into a wagon, riding poneys and "driving" a tractor. Finally, today was the big day. 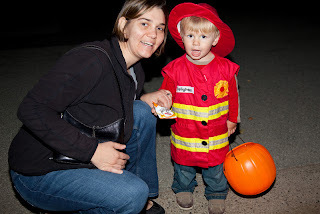 Daniel's costume this year was a firefighter uniform. It had taken me a while to find a good uniform for him. The typical baby costumes for boys are either too bulky or they represent super-heroes Daniel doesn't know yet. 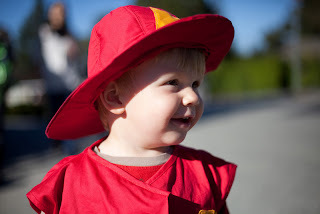 At the end, I thought a firefighter uniform would be perfect for him, since he loves firetrucks. Interestingly enough, Daniel didn't show any interest in the costume, neither when I brought it home a few weeks ago nor on Halloween day (actually he was interested right when he woke up - in his pajamas. But by the time I had managed to dress him the interest had gone). However, he was very interested in the pumpkin carving competition that was taking place at the corner of our street. That these pumpkins could be turned into faces ("monsieur") was fascinating. We finally managed to dress him for the neighborhood Halloween parade, and he was actually quite happy to walk with everyone else. It was probably about 3/4 mile long and he held the pace really well. Trick or treat was also interesting for him. At first, he was confused: I usually have to remind him not to walk on people's yards when we play on the street. Daniel didn't understand why today he was allowed to walk in, and then why he had to stay at the door. After all, when you knock on someone's door, you usually expect to come in! After a few houses, though, Daniel figured it out. He was still shy and didn't say much of a "trick or treat", but he loved getting candy. He was also fascinated by some of the decorations in our neighbors' houses: flying bats, hanging skeletons... He didn't know this should be scary. He just thought it was interesting and kept watching over and over. We only visited a few houses and went back to our own home to welcome more trick or treaters. Daniel happily distributed candy to the visitors, which was surprising given that he usually wants to keep everything for himself. Since today was completely different, he must have forgotten his usual behavior! Overall, it was a good day, even though Daniel is still a little bit young to understand what this is all about. He probably will be asking for candy and pumpkin for the next several days now, or he might just completely forgot that this ever happened... Next year should be even more fun. He should definitely understand better by then. Wondering if he will be able to decide what he wants his costume to be by himself?